Knowing how to make solid drinks at home will save you tons of money and impress your friends and family. Today's post is brought to you by my boyfriend Matt, who is the true cocktail connoisseur in our relationship. We've organized this post into three sections: setting up your basic bar, branching out your liquor supply, and tools & equipment. We are strong believers in quality over quantity (when appropriate) and have established some of our favorite brands of liquor. Try brands out in smaller doses, see if you like them, and you too will soon buy a 1.75 L bottle of Bombay Sapphire. I've been shocked at how delicious mixed drinks can taste at home - especially compared to whatever coke & rum cocktail was the pregame drink of choice in college. In terms of cost, we really believe it's worth it to spend a bit more on cocktails and ingredients that will make you want to have a drink at home before heading out for the night or even instead of. Perhaps most importantly, having a well stocked bar is a quick way to impress friends and family with your good taste! If your favorite spirit is missing, feel free to add it to your own personal list - you know what you like and don't like. This is just our recommendation for what to actually purchase if you want to be able to make mixed drinks and appeal to a wide range of guests. We were surprised when we really sat down and thought about what the basics of a wide range of drinks were, but we've been so happy with what we have stocked in our apartment and still have been able to branch out and add fun spirits that we enjoy having around as well. Gin is the (surprising) quintessential cocktail spirit and is a staple of a home bar. Did you know that gin is in more classic cocktails than any other spirit? A lot of people have a knee-jerk reaction when they hear the word gin, with overly pine-y flavors recalling bathtub concoctions of the Prohibition era. But gin can be so much more than this with a different variety for every preference. Gin is essentially flavored vodka, infused with juniper and a variety of other botanicals like rose or citrus peel depending on the distiller. Bombay Sapphire and New Amsterdam are good brands to start off because of their inoffensive flavor. But, you can branch out to brands like Tanqueray or Junipero, with their juniper-heavy flavors, and Hendricks with its unique rose petal and cucumber infusion. Our favorite is Bombay Sapphire. What to make: Gin is the star of a solid gin and tonic. It's also used in martinis, Tom Collins (essentially, alcoholic lemonade), a French 75, gin gimlet, and many other cocktails. Whiskey is the classic American liquor. Whiskey has been stereotyped as a masculine choice, but it is so versatile and can be used in so many different ways that there is a different whiskey cocktail for everyone out there. There are several different styles of whiskey, including bourbon, rye, and scotch. To start off, we would recommend a rye because it works better in cocktails. Where bourbon is generally sweeter and richer, ryes are drier and contain more spice. This stands out nicely when mixed with other cocktail ingredients. Good entry-level brands include Rittenhouse and Bulleit Ryes. What to make: Whiskey cocktails include Old Fashioneds, Manhattans, Whiskey sours, Mint juleps, Irish coffee, and many more. Bitters are the equivalent of salt and pepper for cocktails. They add depth and new dimensions to your drinks. Start with a small bottle of Angostura—you will only ever use a few drops per drink, so this will last you a while. Fresh lemon and lime juice is extremely important to making a good cocktail. Citrus just doesn’t last that long once it’s been squeezed, so buying and squeezing your lemons and limes rather than using the bottled stuff will make a big difference in the final taste of your drink. We usually buy at least 2 lemons and 2 limes every week at the grocery store - we end up using them by the time they go bad, either in food or in our cocktails! They can really take a drink to the next level and are worth the small risk of 50 cents lost if you forget to use one before it goes bad. But if your bar is stocked like we recommend, we doubt that will happen. Nearly all cocktails require some sort of sweetener in the recipe (which most people like), with most calling for simple syrup. Don’t waste your money buying this from the grocery store as it’s incredibly easy to make. Just heat up equal parts of granulated sugar and hot water on the stovetop and stir until all the sugar dissolves. This should be stored in the fridge and can last for about a month. We store ours in a bottle that's meant to be used for homemade salad dressing - but alas, we prefer cocktails to salad. Club Soda is the base of many cocktails and is the best adult mixer you could ever keep stocked in your cabinet. 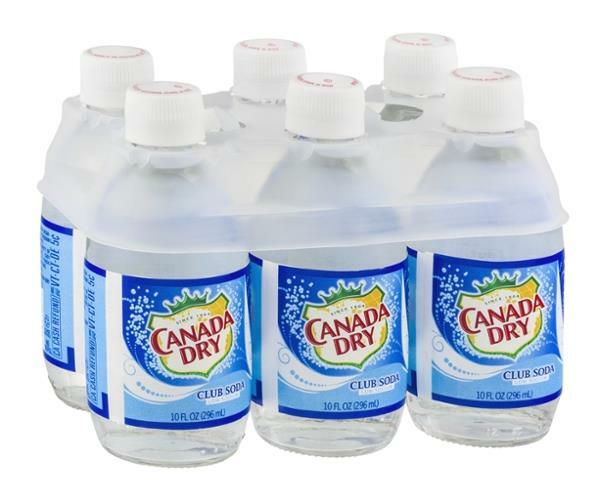 It can be hard to finish a whole bottle (for some people, maybe not for others) so I've taken to buying the mini glass club soda bottles that come in 6 packs in the soda aisle at the grocery store. The premium I pay on packaging versus buying a liter at a time is worth it because we usually only make two drinks at a time. Make sure to buy the bottles rather than the cans, because if you're only making one, you can seal it back up and use it in a few days before it goes flat. If you're a gin & tonic drinker like me, it's also a good idea to always have some tonic water on hand as well. It comes in the same mini-6 packs. What to make: Anything, but try a Tom Collins! As the name implies, this is a necessity for any shaken drink. As a rule of thumb, any drink containing non-clear liquids—citrus, egg white, etc.—should be shaken. There are two distinct styles of shakers, the cobbler and the Boston shaker. The cobbler is the three piece shaker with a built in strainer that you often get in a bar set, whereas the Boston is the two piece tins that you see at every bar, ever. There is a reason the pros only use Boston shakers—when the cobbler shaker gets cold from the ice, the pieces can be nearly impossible to get apart, trapping your drink inside. Boston shakers are much easier to use and clean. One thing to note, however, is some shakers come with two tins, whereas some come with one and a pint glass. We would stay away from the sets that use the glass, as this has the potential of shattering when it’s in your hands. Go for this one. Again, as the name implies, this is for mixed cocktails. A lot of times at bars you will see them use fancy looking glass beakers called “yarai” glasses. These are nice to have, but are expensive and not necessary. Save some space (and money) and just use the bottom tin of your shaker. After mixing or shaking your drink, you need to strain out the ice cubes. A Hawthorne strainer will fit right on top of your tin or mixing glass and do just this. 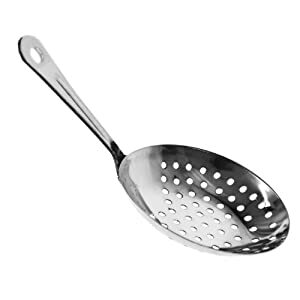 You might also see julep strainers, which look like giant spoons with holes in them. These are traditionally used for stirred drinks, but are not necessary to have. A Hawthorne strainer will do the trick and is simpler to use - less spillage. Used to mix cocktails, this is just a really long skinny spoon. It’s not a need to have, but it does make mixing drinks much easier than with a normal spoon. We use ours all the time for drinks like a Tom Collins or gin & tonic. Plus, it looks pretty impressive. Jiggers help you measure precise amounts of liquid to make the perfect drink. It's essentially the grown up version of a shot glass, because you're adding more to your drink than just a shot of alcohol straight into your mouth - usually some citrus juice, or club soda...you get our point. We are fans of the Oxo mini angled measuring cup. We also use it when cooking too! All set up and wondering where to start? Check out The Craft of the Cocktail for a classic guide to everything shaken and stirred. Subscribe to the blog for future posts about how to expand your bar and how to make your favorite cocktails at home. Note: This post contains affiliate links for products I recommend. That means if you click on a product link in this post and choose to purchase the product on Amazon, I earn a commission. I only recommend products I use and love organically. This means that if you are going to purchase a product that I recommend, I encourage you to do it through the direct link from the blog so that I (and the blog) benefit. Read my full affiliate disclosure.